Recently, we decided to make something fun that we knew our kids would love to eat as a snack or as a meal. t Our families love pizza, especially sausage pizza. But recently, we were in the mood to make something different from the traditional pizza recipe. 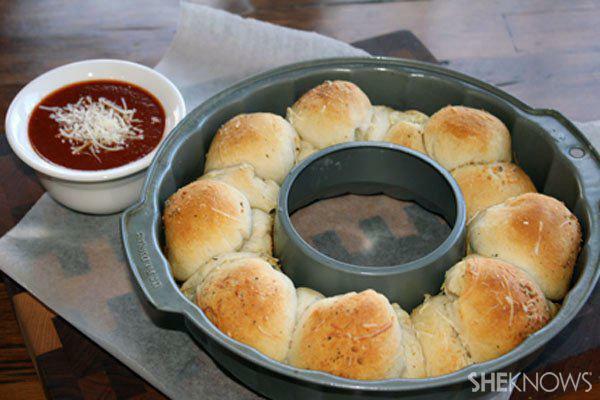 So we made one of our favorites: sausage pizza bubble bread. t Jimmy Dean’s Fully Cooked Sausage Crumbles provide a quick and easy way to add a dash of delicious to any recipe, especially this one. Using Jimmy Dean’s Hearty Hot & Spicy Sausage Crumbles makes prepping this recipe super-easy and super-delicious. t Tip: Jimmy Dean Fully Cooked Sausage Crumbles are found in the refrigerator section of your grocery store. Enjoy! Preheat your oven to 350 degrees F. Spray a Bundt pan with nonstick spray and set it aside. In a small bowl, mix the melted butter, Italian seasoning, garlic powder and salt. Then set it aside. Separate 1 can of refrigerated biscuits. Take 1 biscuit and place 2 cheese pieces in the center with 6 sausage crumbles. Bring the dough up around the filling and press the edges to seal and shape it into a ball. Repeat with all the biscuits. Roll the stuffed biscuit balls into the melted butter mixture and place them in the Bundt pan. Repeat steps 3 and 4 with the remaining cans of biscuits. Place the biscuits over the balls that are already in the pan and sprinkle them with Parmesan cheese. Bake for 30-35 minutes, until the biscuits are golden brown. Then let the biscuits cool slightly. Loosen the biscuits and invert the pan on a serving plate. Serve with warm pizza sauce.